It was huge, 3,100 square km till the late 1920s. A lifeline of the ancient Silk Road, it was first mapped by ancient Chinese geographers. But the salt lake in the southeastern part of Xinjiang Uygur Autonomous Region has largely dried up today, with marshes and small, shifting lakes receiving the channels of the Tarim River. It's true, Lop Nur is still there, but at best it can be described as a marshy depression. Nature's fury is about to make history repeat itself; this time in Northwest China's Gansu Province as another tragedy. The Minqin Oasis is still about 1,000 square km, but is shrinking fast. Scarily, its surrounding geographical features are similar to that of Lop Nur. It's surrounded by the Tengger and Badain Jaran deserts and is vanishing at an alarming the rate of 3 to 4 meters a year, says Gansu Vice-Governor Shi Jun. Reclaiming of forests and grasslands for agriculture and the unprecedented dry weather of recent years have been blamed for the ecological and economic threat. But the National Conference on Desertification Prevention held in Beijing late last month was determined to not let it disappear. "No stone should be left unturned to stop Minqin from vanishing," Shi told the conference, the fifth of its kind. 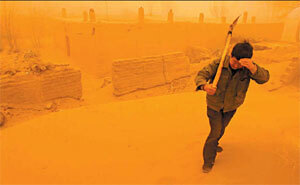 A farmer struggles to keep his eyes open during a sandstorm in Minqin, Gansu Province. That the central and provincial governments are committed to saving the country's ecology became evident at the conference when governments of 12 provinces and autonomous regions signed agreements with the State Forestry Administration (SFA) to fight desertification. Desertification disrupts the lives of 400 million people and causes direct economic losses of 54 billion yuan ($7 billion) a year, SFA figures show. That's the reason why the efforts of the governments of Hebei, Gansu, Shanxi, Shaanxi, Liaoning, Jilin, Heilongjiang and Qinghai provinces and the Inner Mongolia, Ningxia Hui, Xinjiang Uygur and Tibet autonomous regions are so important. These governments will allocate special funds during the 11th Five-Year Plan period (2006-10) to prevent desertification and fight sandstorms, with their contributions increasing in proportion to the annual revenue growth. These efforts have borne fruit, for China's deserts have shrunk by 1,283 square km annually in the past five years, instead of expanding by 3,436 square km a year as they did till the late 1990s, according to SFA data. In fact, 2001 was the first year the trend was reversed since the People's Republic of China was established in 1949. The country began a green movement after floods claimed more than 1,000 lives and rendered about 1 million people homeless in Sichuan Province in 1981. Every person above the age of 11, except the old and physically challenged, were asked to plant three to five saplings every year or contribute equally in some other way to save the environment. More than 12 billion trees have been planted since 2001, which means an average person has planted 10 trees in five years. But the government's fight against desertification and damage to the environment is not confined to planting trees. It has banned tree felling and logging along major parts of the Yangtze and Yellow rivers and converted more farmlands into forests and grasslands. But despite all this, "the fight against desertification is far from over" SFA Director Jia Zhibang says. Grazing, logging, timber smuggling and collection of firewood still pose a threat to the environment and contribute to global warming. The government needs to improve legislation to check desertification, he says, and deal with those harming the environment most severely. It should strengthen global cooperation, too. China joined the United Nations Convention to Combat Desertification in 1994 and has since encouraged international cooperation on the issue. "China has made tremendous achievements to fight desertification," says the UN convention's executive secretary Hama Arba Diallo. "We hope more countries can share China's successful experience," Xinhua has quoted Diallo as saying. "Regaining lost land is too expensive. Prevention is the only solution for developing countries." Israel is an apt example of what a country can do to regain land lost to the desert. But the cost has been too high. Desertification has been spreading like cancer. In fact, it is referred to as the "cancer of the Earth" and affects about a fifth of the world's population. The loss of crops across the globe because of degradation of land is about $42 billion a year, says the UN Environmental Programme that declared 2006 a year of focus on deserts and desertification. UN has urged countries, especially the developing ones, to integrate more desertification prevention measures into their economic policies to ease the effects on agriculture, economy, health and society. China implemented the Desertification Prevention Law in 2002 to curb harmful human activities, including illegal tree felling, overgrazing, random plucking of medicinal herbs and over-exploitation of water resources. The measures were taken to reduce the economic loss of billions of yuan a year. Droughts and sandstorms reduce agricultural production and cause damage to infrastructure like railways and roads. Sandstorms in North China not only disrupt normal life, but also bring industrial production to a standstill and cover agricultural land with sand and dust. The huge amount of silt they deposit in rivers and other water bodies affects marine life and biodiversity and creates a big problem for water treatment. The government spends 2 billion yuan ($260 million) every year to fight desertification, but it's difficult to reclaim all the "curable" land by the targeted year of 2050. The cost of that would be about 240 billion yuan ($31 billion), SFA Deputy Director Zhu Lieke said last May. More than 530,000 square km of "controllable deserts still lie untouched", Zhu said, because of lack of funds. The onus to save the environment, however, is not only on the governments be they central, provincial or at the lower levels. The public, too, has a big role to play in that, hence Zhu has asked the governments at all levels to promote environment awareness among the people. Experts concede that checking the spread of deserts is a complicated process. It needs interdisciplinary review of available technologies. "Since drought and semi-drought areas have a very fragile biodiversity, scientific programming and use of land and water resources becomes the core issue," Chinese Academy of Forestry professor Ci Longjun says. Different measures should be adopted for different areas, depending on the type and degree of land degradation. For instance, the large-scale shelter forest belts built to protect arable land in the plains of Northeast and North China, the upper reaches of the Yellow River, the Hexi corridor in Gansu and oases in Xinjiang have increased grain output by over 8 million tons a year. The shelter belts in the mountainous regions of North, Northeast and Northwest China have helped farmers reclaim 1.4 million hectares of arable land and 10 million hectares of grasslands. A national sand control project started in 1991 has turned 5.4 million hectares of arid land into 600 integrated development zones that today house orchards, timber forests and other commercial plants. The forestry project in Beijing-Tianjin rim has added 1.8 million hectares of forests, increasing the area's green cover to about 30 percent and reducing sandstorms that occur mainly in March and April. Thanks to the afforestation projects in the nearby regions, including Hebei and Inner Mongolia, sandstorms are less of a problem for Beijing today. Hebei has started a series of measures to check desertification in the areas around Zhangjiakou and Chengde, a major source of sandstorms that hit the capital every year. More than 200,000 hectares of arid and sandy land around Beijing and Tianjin has been converted into forests and grasslands in the past five years, according to the Hebei forestry department. The province, a major source of water for the capital and Tianjin, has spent heavily on afforestation and sand control. The result: better water quality in the three major reservoirs of Miyun, Guanting and Panjiakou. Guanting's annual sand content, for instance, has come down from 9 million tons a year before 2000 to 2 million tons today. A drive as powerful and dedicated is needed to save the Minqin Oasis and all other places and things, big and small, important for our and children's survival.